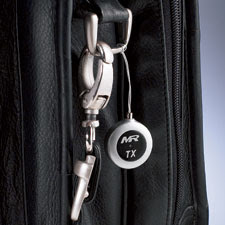 The MiniReminder is an electronic novelty used to make sure you don't lose one of your precious EDC items or gadgets. This gadget has two parts, one receiver and one emiter, you attach the emiter to your item/gadget and keep the receiver with you in your pocket or keychain. The emiter will send radio signals to the receiver and if the units get sepparated 10 or 25 feet (you can set two distances) the receiver starts to vibrate and beep letting you know you have just forgotten your EDC item somewhere. The manufacturer recommends this for MP3 players, tools, flashlights and even kids(!). The idea is very cool, in the practical use sometimes the radio signals can't travel well or are blocked and the receiver starts to beep and vibrate when nothing has happened, attending the false positives can be a little annoying so our impression is that this is useful for some special item that is in risk of being forgotten but probably not practical for simple EDC items. Anyway a curious gadget that you may want to experiment. You can read more and order for $40 from this site.